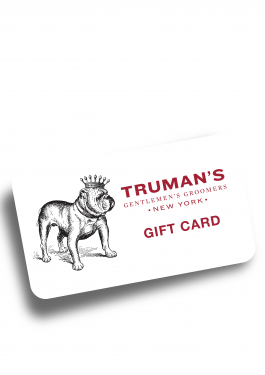 Choose the type of gift card and amount you’d like to purchase. Choose the amount you’d like to purchase. For multiples of the same amount each one needs to be added to the cart separately. 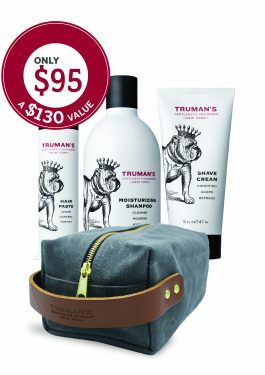 Upgrade your grooming regimen with Truman’s top seller Moisturizing Shampoo, Truman’s high-performing Hair Paste, and Truman’s fan favorite Shave Cream, along with Truman’s handsome wax canvas, durable Dopp Kit with nylon interior and branded leather strap. A $35 dollar savings. A la carte price for these three products is $54. Includes: Facial Cleanser, Shampoo, and Shave Cream. 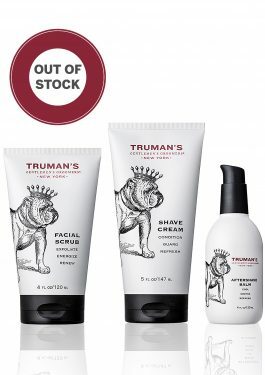 Truman’s Facial Cleanser, Shampoo, and Shave Cream provide the basic necessities for the well-groomed man. 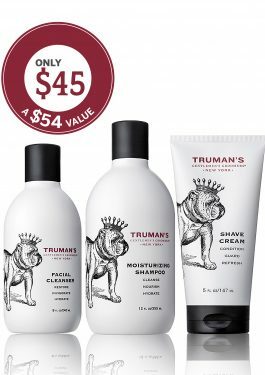 Step One: use Truman’s Moisturizing Shampoo for clean hydrated hair and a invigorated, healthy scalp. Step Three: use Truman’s Shave Cream, which provides the ultimate razor glide and is formulated to leave your face smooth and hydrated. A la carte price for these three products is $60. Includes: Facial Scrub, Shave Cream and Aftershave Balm. 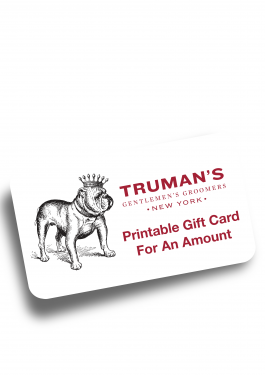 Truman’s Shave Regimen provides the ultimate in home shave experience. 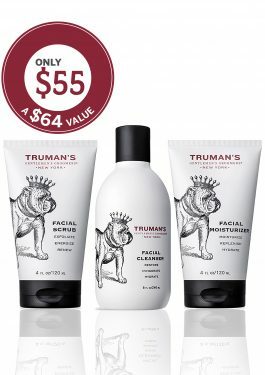 Step One: prep your face using Truman’s Facial Scrub. This clears away dead skin and opens pores creating the best environment for a non-irritating shave. Step Two: use Truman’s Shave Cream, which provides the ultimate razor glide and is formulated to leave your face smooth and hydrated. Step Three: thoroughly massage face with Truman’s lightweight and ultra-cooling Aftershave Balm to soothe and reduce irritation to the face. A la carte price for these three products is 64$. Includes: Facial Scrub, Facial Cleanser and Facial Moisturizer. This simple 3-step routine will clean, rejuvenate and hydrate your skin. 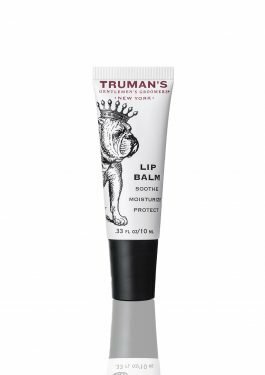 Truman’s deeply therapeutic Lip Balm heals chapped and cracked lips while relieving dryness and irritation. Water resistant and long-lasting to maintain maximum comfort under all climate conditions.